A wickedly rich, layered dessert combining pears and chocolate with creamy mascarpone and Belgian double chocolate muffins. In a large bowl, beat together the double cream and mascarpone with an electric or balloon whisk until softly whipped, smooth and forming soft peaks. Using a metal spoon, fold in the Baileys liqueur until just combined, then place the mixture in the fridge to chill. Chop the muffins into roughly 1cm cubes, place in the bottom of 6 serving glasses and top each with 1 teaspoon of chocolate sauce. Coarsely grate the chocolate and place on a plate in the fridge until ready to serve. Cut the pears into 1cm pieces and use half to top the muffin pieces. Layer with half the mascarpone mixture, top with the remaining pears and another teaspoon of chocolate sauce, then finish with the remaining mascarpone. Scatter with the grated chocolate and serve. Use chocolate decorations such as Cadbury Curls Minis instead of making your own. This dessert can be made up to 2 hours ahead and kept in the fridge. 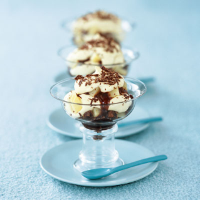 This pudding works best with a glass of Baileys - The Original Irish Cream, served over ice.